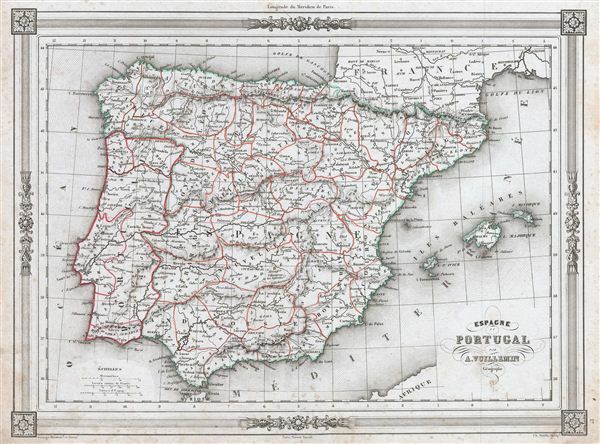 An uncommon and extremely attractive 1852 map of Iberia or Spain and Portugal by A. Vuillemin. The map covers all of Spain and Portugal from France to the Mediterranean Sea and includes the Balearic Islands of Ibiza, Majorca, and Minorca. Throughout, the map identifies various cities, towns, rivers and assortment of additional topographical details. As this map was drawn the Spanish prime minister Juan Bravo Murillo was dismissed form office . Liberal sentiments within Spain were growing rapidly, leading to the Progressive Biennium, in which the Progressive Party tried to replace the conservative liberalism of the Moderate Party and advocated radical liberalism. The map features a beautiful frame style border. Prepared by A. Vuillemin for publication as plate no. 16 in the 1852 Maison Basset edition of Atlas Illustre Destine a l'enseignement de la Geographie elementaire.